18 gauge jump rings are a nice, heavy weight for attaching dangles and drops. The substantial feel is great for heavier elements or when you just want a more pronounced look. Remember that jump rings should always be opened as if on a hinge, never by drawing the ends directly away from each other. These little jump rings are perfect for attaching charms to beaded bracelets. The 18ga makes them super strong and durable. The beads should be 4mm or smaller if you plan to attach to a beaded bracelet. 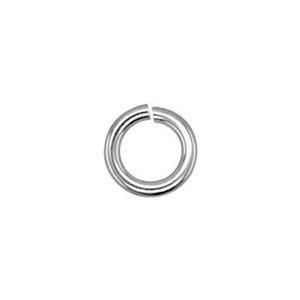 Go for the 6.5mm (SJ1065) if the beads are 5mm or larger.